On page 43 of the February 1989 issue of the Canadian magazine En Passant, Dr Nathan Divinsky claimed that Magnús Smith and Colonel Moreau were ‘borderline cases’ for the award of a posthumous Grandmaster title. For that and various self-evident reasons, we were not expecting to enjoy Warriors of the Mind by Raymond Keene and Nathan Divinsky (Hardinge Simpole, Brighton, 1989), though we still hoped we would. Alas, expectation soundly defeated hope. 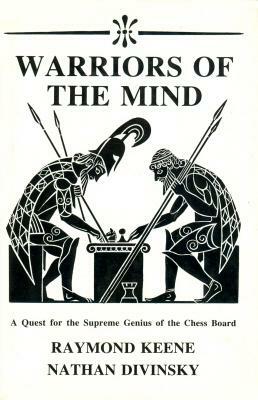 Subtitled ‘A Quest for the Supreme Genius of the Chess Board’, Warriors of the Mind hazards a guess at the best 64 players of all time (including Szabó, Furman, Kholmov and Hort but not Réti, Spielmann or Tartakower), calculates most (not all) of the results between them, juggles the figures and then proclaims that ‘the strongest chessplayer of all time’ is Garry Kasparov. Elo ratings were considered good enough (more or less – page 13 admits that the selection process was arbitrary) for picking the 64 candidates – one for each square of the board, as if anybody cared – but not for deciding Number One. That results from a series of complex weighting operations, one reason being that ‘when we talk of the strength of some old time champion, like Wilhelm Steinitz, we mean his strength, today, [sic] after he has had some time for further study, to absorb the theory and knowledge that was developed after his time’ (page 4). Not that this has been properly taken into account in the picking of the 64. One might in any case ask on what basis it is assumed that each generation has built on its predecessors, at least in the present century. Most master games are won or lost in the middlegame; what precise scientific advances have been made in that phase of the game since, let us say, the 1930s? Page 1 warns that ‘we should divest ourselves, as much as possible, of any pre-conceived ideas or prejudices. For example certain names are quite famous because of the books they wrote rather than the level of their play, names like Nimzowitsch, Tartakower, Tarrasch and even Alekhine.’ That is worth comparing with another page one, page 1 of Aron Nimzowitsch: A Reappraisal, in which Raymond Keene described Nimzowitsch as ‘one of the world’s leading Grandmasters for a period extending over a quarter of a century, and for some of that time he was the obvious challenger for the world championship’. Now, however, he knows better; Nimzowitsch just scrapes into the top 50. Nor will everyone be able to divest himself of the preconceived idea or prejudice that Alekhine (Kasparov’s hero, so Raymond Keene never used to tire of telling us) was one of the all-time greats, but the co-authors are having to pave the way for the shock revelation on page 323: Alekhine comes only 18th in the list of the best players in chess history. Alas, the book ignores the fact that although Alekhine had to play the best while they were at their best, Kasparov has not, except in the case of Karpov. From Kasparov’s record against the 22 players listed in Warriors of the Mind, it should be noted that only Short, Yusupov and Seirawan can be called contemporaries. On average, the other 19 are well over a quarter of a century older. Thus Kasparov’s figures include a dazzling 100% record (+1 –0 =0) against Najdorf, who is old enough to be Kasparov’s great-grandfather. Another half-dozen could be his grandfather. This is said not to decry the world champion’s chess genius, but to emphasize the absurdity of such statistical comparisons. Page 15 lets another cat out of the bag. Concerning the Kasparov-Short games played at 25 minutes per side, it is disclosed that ‘we did not include them, but in principle we see no objection’. ‘No objection’, the authors are admitting, to throwing 25-minute games into the pot with world championship match games. While pondering whether they therefore see any objection to including Capablanca’s 1914 lightning match victory over Lasker, the co-authors would do well to sort out their policy on exhibition games (see the faulty Capablanca v Bernstein totals on page 75 and page 94). 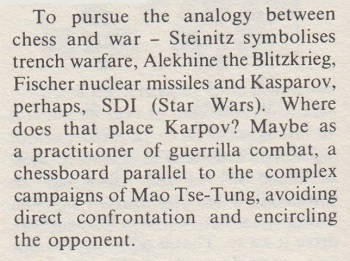 Then comes the biggest part of the book, the ‘biographies’ and games by the lucky 64. A quote from page 23 about Steinitz (died 1900) is irresistible: ‘One traditionally pictures Steinitz struggling in the trenches. His chess seems almost a symbolic portent of the conflict of the Great War 1914-1918.’ That’s a deep one. Nothing is dealt with in detail or with care. Alekhine’s birth-date is wrong, as is Capablanca’s death-date. The Lasker-Janowsky match in Paris is still incorrectly called a world championship encounter; Capablanca is still falsely accused of demanding money in gold in 1922 as part of the London Rules; New York, 1927 is still being described as possibly having been a Candidates’ event (of which there is no question at all). That is the trouble with scissors-and-paste books: what a writer got wrong before he will get wrong for ever more. Seirawan’s ‘biography’ (pages 278-279) is lifted lock, stock and barrel from page 53 of Raymond Keene’s notorious Docklands Encounter, with the sole exception that ‘my feeling’ has been changed to ‘our feeling’. As noted in C.N. 904, Docklands Encounter asserted that Seirawan was ‘born in England’ (instead of Damascus). Warriors of the Mind naturally repeats the gaffe. Page 43 of the book remarks that in view of his record Lasker ‘has claims to being the greatest world champion of the thirteen’ (cf. ‘Kasparov, the most successful world champion chess has ever seen’ – Raymond Keene, The Times, 29 April 1989, page 41). Schlechter receives three times as much space as Marshall, though the book claims they were roughly the same strength. Důras ‘appears to have been a real coffee-house player’ (page 78). Rubinstein died in ‘an old peoples’ [sic] home’ (page 82). Page 115: faulty German in the title of an Alekhine book. Page 119 and page 341 refer to a magazine which will be news to one and all: ‘Tijdschrift van den Nederlandsch-Indischen [sic] Schaakbond’. We can be sure that such misinformation was not supplied by the Rob Veerhouven [sic] mentioned on page 68. [In C.N. 1872 Jeremy Gaige pointed out that a magazine entitled Tijdschrift van den Nederlandsch-Indischen Schaakbond did exist. It was published in Indonesia.] Page 128: Harry Golombek’s book was not called 1948 World Championship. Nor was it published by the ‘British Chess magazine’ [sic] but by Bell (the BCM merely did a reprint decades later). Pages could be filled with a detailed catalogue of the book’s defects as it stumbles along with superficially annotated Famous Games, ending up with Short-Ljubojević, Amsterdam, 1988. 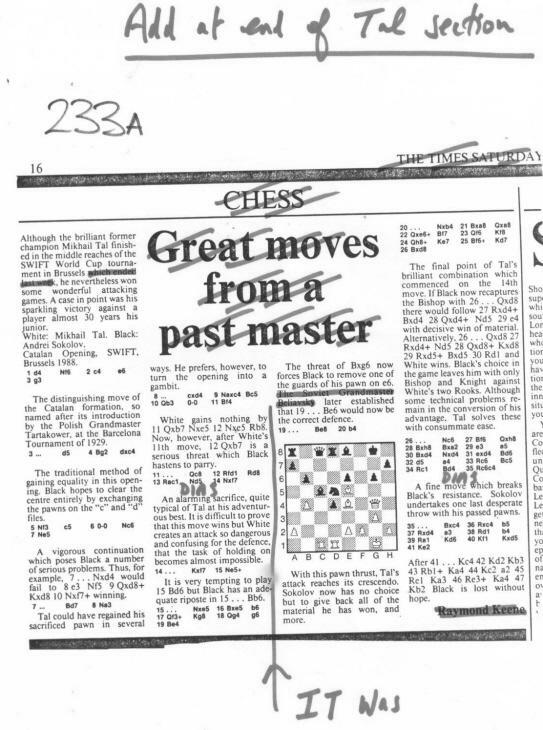 Here the annotations are lifted, unacknowledged, from The Spectator of 19 March 1988 (page 52) though there are minor variations; thus The Spectator referred to the position after Black’s 27th move as being ‘a unique occurence’ [sic]. For Warriors of the Mind the spelling hasn’t been corrected, of course, but a deft nuance has been introduced: now it is ‘An almost unique occurence’ [sic]. By then we are at the concluding mathematical section. The authors’ (inaccurate) research yielded 10,148 game results with the following top percentage scores: 1 Morphy, 2 Lasker, 3 Capablanca, 4 Fischer, 5 Kasparov, 6 Alekhine, 7 Karpov. But now, they say, amendments have to be made to take account of 1) ‘opposition strength’, 2) ‘era effect’ and 3) ‘career span’. On criteria 2 and 3, at least, one would expect Capablanca, to name but one, to surge ahead, not least because the table on pages 313-314 shows the Cuban with a better record than Kasparov (more wins, fewer draws and fewer losses). Nor could he expect to lose out on criterion 1, because, as we now know, direct comparisons of Elo ratings between generations are unreliable, and the figures favour the moderns. But it is not to be. One way or another, Kasparov and Karpov are brought out on top, and Botvinnik is left looking silly for having said on page 257, ‘Of course, I consider Capablanca a greater player, a bigger talent [than Karpov].’ Page 313 reveals who were the ‘winningest’ [sic] players. Page 325 says that ‘apart from Lasker, Capablanca and Alekhine, Rubinstein was clearly the genius of his age’; the co-authors have evidently forgotten that just two pages earlier the same Rubinstein was cast off as the 44th greatest player of all time, just behind Hort. On page 331 we learn that The Hague 1948 [sic – no mention of the Moscow half of the event) was the stongest [sic] tournament ever. Page 336 explains that the calculations would have held good if Tartakei [sic] had been included in the 64 top players. The book finishes with a blunder-ridden bibliography, which advertises not only an inordinate number of Raymond Keene’s own books but also such literary phantasms as ‘Selected Games of Paul Keres’ [sic], 3 volumes, by Keres and Alexander [sic]. The dust-jacket calls Warriors of the Mind ‘a seminal work written by two scholars of the game’. In reality it is swill. As reported on page 141 of A Chess Omnibus, in 1999 the co-publisher of Warriors of the Mind, Julian Hardinge, dismissed our review as ‘an apoplectic catalogue of the typographical errors in the book’. In 2002 his company re-issued the tome. Although two extra pages were found for some puffery, textual corrections were not made, and the innumerable gaffes were allowed to stand. ‘Tartakei’ remained ‘Tartakei’. Warriors of the Mind was discussed in an article entitled ‘Ex Acton ad Astra’ on pages 18-33 of the Spring 2007 issue of Kingpin. The magazine’s Editor kindly allowed us to reproduce an illustration from page 31 (given at the start of the present article). Latest update: 11 May 2017.